I captured this scene at the British Museum, in London. 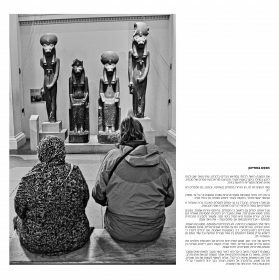 Two women were resting for a moment during their visit of the Egyptian section, facing four statues of Sekhmet, one of the most known Egyptian Goddess. 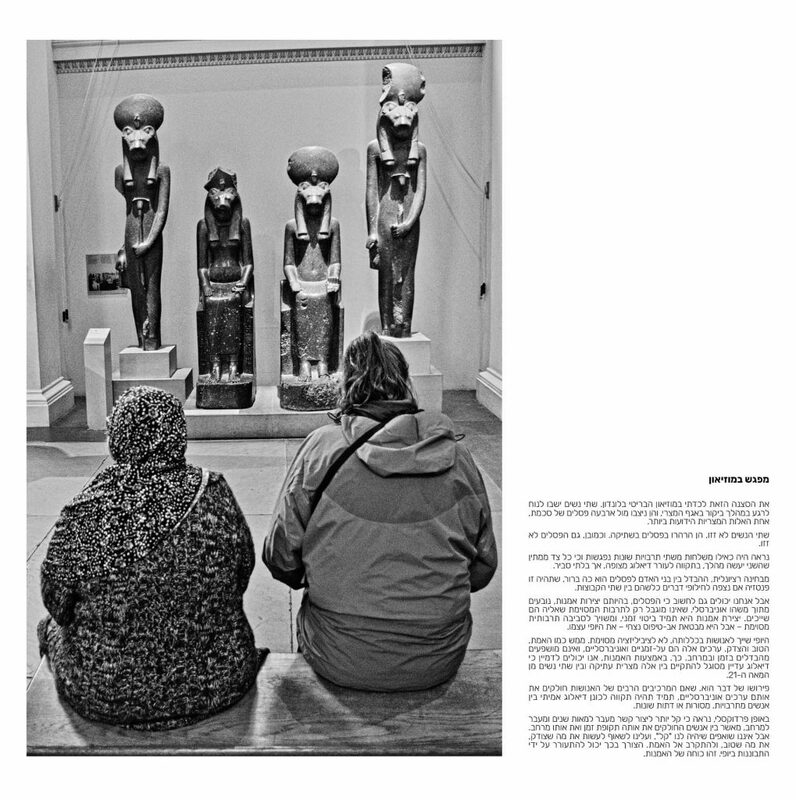 The two women didn’t move, they contemplated the statues in silence. And of course, the statues didn’t move either. It seems as if delegations of two different cultures met and were waiting for each side to make a move, in hope of engaging in an expected but quite improbable dialogue. From a rational aspect, the difference of essence between human beings and statues is so obvious that it should be a fantasy to expect any exchange between both groups. But we can also consider that the statues, as pieces of Art, emanate something universal and not limited to the specific culture to which they belong. A piece of Art is always a temporal manifestation – in a specific cultural environment – of the archetypal BEAUTY. Beauty belongs to Humanity, not to any particular civilization. Truth, Good, and Just. are also a-temporal and universal values that will not be affected by distances in Time and Space. Thus, through Art, we can imagine a possible subtle dialogue that may occur between an ancient Egyptian Goddess and two human beings from the 21thcentury. It also means that if the many components of Humanity share the same universal values, there will always be a hope for establishing a real dialogue between people from different cultures, traditions or religions. Paradoxically, it seems easier to build a link through centuries and space than between people sharing the same epoch and the same space. But “easy” was never a purpose in life, and our drive should be to do the Just, the Good and to approach the Truth. The need for this can be triggered and awakened by contemplation on Beauty. This is the power of Art.